I’m going to be starting a new thing here on Ally Jean where I’ll feature sweet celebrations out there on the Interweb. This week’s adorable party is this Eat, PINK, and Be Married bridal shower featured on Hostess with the Mostess by Bloom Designs. There are so many dreamy details on this princess of a party that are totally swoon worthy. 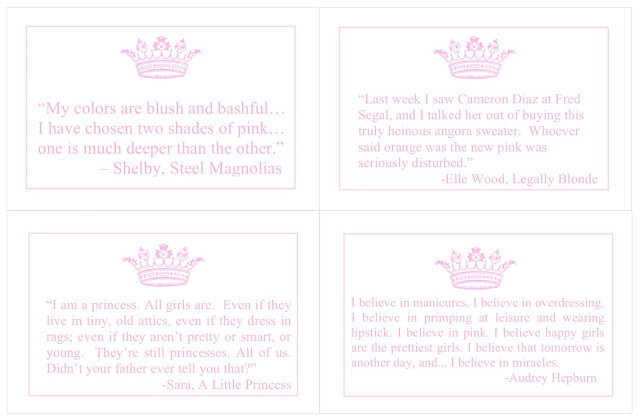 Some of my favorites were definitely the framed “pink” quotes on each table; from Elle Woods, to Audrey Hepburn, each table provided adorable views on the color pink. The table quote printables were so cute, Jenny from Bloom Designs is more than happy to send you the sweet PDF! Check out her blog for more information! Every little detail of this party was simply stunning. Click here to see more pictures of this great party from Hostess with the Mostess and Bloom Designs.